Things you must do before you can import the widgets and content. 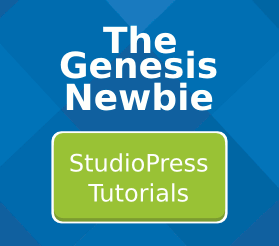 The Genesis Framework and your chosen theme must be uploaded to your site. The theme you are setting up must be activated. Your chosen THEME MUST BE ACTIVATED! For most themes, the Genesis eNews Extended plugin and the Simple Social Icons plugin must be installed and activated. See my list of plugins used in StudioPress demo sites to discover if your theme needs any other plugins. I have made .wie Widget Importer & Exporter files for all of the themes designed by studioPress and listed on the StudioPress themes page. I have bundled all these set up files into one zip file download. THEMES LISTED AS THIRD PARTY ARE NOT INCLUDED IN THIS GUIDE. However, most third party themes provide .wie files already. To import the widget settings into your site you need to use the Widget Importer & Exporter plugin and the file you downloaded with a .wie extension from my site. To import the web pages into your site you need to use the WordPress Importer plugin. You also need the file with an .xml extension that is provided by StudioPress. You can find this file inside your theme’s zip file. Make a copy of your theme’s zip file. Open the zip file and look inside the xml folder. This folder only contains one document, it’s an xml import document that sets up your demo site with the same demo content that the StudioPress demo site uses. Usually, photos are not included in this demo content. However, grey placeholder images are included. Always scan files you download! Whenever you download any files from the internet, always scan them for viruses before opening them! After downloading the correct set up files for your particular theme, unzip the files onto your desktop so you can easily find them when you’re ready to use them. You will need a .wie file and a .xml file. You should have already downloaded my .wie zip files. And got the StudioPress .xml file from inside your theme. Make sure both of these files are for your SPECIFIC theme. Make sure you have saved these two files to your desktop where you can easily find them. If you’ve got all this set up, you can move on to import the content and widgets into your website.